After many weeks of planning and preparation it finally happened… On the 31st of October the first Dutch Sitecore User Group meeting was held at the NCIM Groep in Leidschendam! 19 Sitecore enthusiasts from several companies across the Netherlands attended this event including two Sitecore representatives; Rudy van Herpt and Alex de Groot. I started the evening by introducing the user group, its goals and the members of the steering committee. The slides (in Dutch) are available for download in pdf format here (highly recommended for all who are interested in the user group). We discussed possible topics for upcoming SUGNL events and the format to present them, taking into account our broad target audience (dev/marketer/content manager). The format will be a mix of client cases, technical presentations and discussions on best practices and tips & tricks. Although most of the attendees have a background in software development or marketing many stressed the importance of end-users attending the user group meetings as well. Annemarie, Jeroen and Arend briefly explained how they typically tackle Sitecore related challenges at Suneco and that it usually requires a joint effort between all competences. Next Robbert showed some screenshots of the SUGNL prototype website. Robbert made an initial design which was further refined by Estate (many thanks for that!). In the next several weeks Robbert will devote his spare time building this website. Then it was up to me to give short demo on Sitecore Item Buckets. This is an excellent Shared Source Module available for free on Sitecore Marketplace. I made a small example how Item Buckets could be used for managing a large set of movie and actor items in Sitecore (and yes I am a Bond fan!). The demo initiated some great discussions between several people who are already using this in production environments. Thanks to Jeroen (Suneco) and Ruud (Partech) for sharing their experiences and insights. After seeing a screen full of C# code it was time for some people to get a drink. So we ended the evening with drinks, snacks and great conversations. The first Sitecore User Group NL meeting was a big success! Many thanks to all the attendees. I hope to see all of you again at next SUGNL events. To register for upcoming events please visit http://sugnl.eventbrite.nl. The next event, on December 12, will be an informal drinks session at café Zussen in Utrecht. The next meeting with presentations will be held on January 23 at eFocus (exact program will be disclosed next month). If you want to stay informed please join the SUGNL group on LinkedIn or follow our Twitter account: @SUG_NL. See you at the next SUGNL event! On the 5th and 6th of September I attended the Sitecore Symposium in Amsterdam. Here are some snapshots I took during this great event. Since I needed to be in Amsterdam on the evening of the September 4th anyway I briefly went to the Okura Hotel to register. I collected my badge, had a coffee and talked with Mark van Aalst (Sitecore NL) about the Dutch Sitecore User Group (more on that later). On the first day of the Symposium I arrived a bit late. The keynote by Michael Seifert had already started. When the evening program was disclosed it was announced that a trip to Las Vegas could be won, woohoo! Day 1 – Win a trip to Las Vegas! After the keynote a small guerilla action took place to promote the Dutch Sitecore User Group (many thanks to the distributor of the flyers 😉 ). If you want to join the first meeting of the Dutch Sitecore User Group on the 31st of October please register here. Being a developer I was of course most interested in attending the Developer Track. This started with a keynote by Kerry Bellerose and Lars Nielsen about all the new features Sitecore had been working on lately. One of the main features is Foundry 4. This module enables advanced multisite management and will be made availble for free! Next Tim Ward gave an excellent presentation about various solutions to handle multisite environments. He presented a completely new module called ‘Sitecore Multisite Manager’ which can be downloaded from github. Really impressive work! The last presentation of day 1 was certainly one of the most memorable ones. It was a ‘drama play’ featuring Kerry Bellerose (as the project manager) and John West (as the Sitecore consultant) on how to avoid 5 common pitfalls when doing Sitecore projects. Although the idea of this drama play was nice, the result wasn’t what I had hoped for (although it was quite entertaining in certain ways ;). I prefer seeing John West talk about in depth technical stuff. That is where he really shines. The second day of the symposium started with a mind-blowing presentation by Tim Ward about Item Buckets. These Buckets are meant to hold very large numbers of items without degrading performance when manipulating or querying these items. The ‘Sitecore Item Buckets’ module can be downloaded from github. When using the Sitecore Item Buckets, a new search field (based on SPEAK) is available in the Content Editor. Tim showed various ways how this field could be used to query items in the Buckets. I think the entire audience was in awe after this presentation. It was certainly my personal favorite. Since I wanted to learn more about the available personalization options in Sitecore I made a small sidestep to the Product Track and attended ‘The Many Types of Sitecore Personalization and When to Use It and How’ presentation by Lars Petersen. Lars is an entertaining speaker and this was a very informative presentation (although as a developer I missed seeing some code 🙂 ). Back on the right track for another presentation by John West. This time about Sitecore MVC and other ‘Killer Features’ of Sitecore 6.6. Again a ‘drama play’ performed by Kerry (the PM) and John (Sitecore dev) where John educates Kerry about the benefits of using Sitecore MVC. In my opinion the drama could have been skipped and that time could have been better spent on a more in depth view on Sitecore’s MVC implementation. In the Q&A session afterwards Robbert Hock asked some questions to John West. Next another great developer oriented presentation by Lars Nielsen about how to become the marketer’s best friend. Since I don’t have many friends in marketing this was a perfect fit for me :). Lars gave a very funny demonstration which involved ‘John East’, the overeager developer. Lars showed several ways how to use the DMS API to extract valuable customer statistics by involving multidimensional space mathematics. It was very inspiring to see what can be achieved with DMS. The final developer presentation was given by Morten Ljungberg on how to use the excellent Visual Studio extension Sitecore Rocks. Although many of shown features were known several small gems were revealed that makes life of a Sitecore developer even easier (such as Commandy). Day 2 – Sitecore Rocks! This was my first Sitecore Symposium and I enjoyed it immensely. It was great meeting other Sitecore enthousiasts in real life and seeing the faces behind the Twitter avatars :). The only downside was not winning the Social Media contest ;), congrats to Robbert though! The way the Sitecore products move forward, being improved and extended continuously (and some even being provided free of charge), is very exciting and I look forward using many of the new features. Until the next Sitecore Symposium or the first Dutch Sitecore User Group meeting! Hi Martijn, I frequently post marketing events on my website. This is not so hard to do, actually due to Sitecore this is quite easy! However, when I want to specify the start and end times I always have to provide the date as well, even when the begin and end dates are the same. Next to the fact that this is slightly annoying, it also looks misplaced and confusing. Do you have a solution for this? What is a Time Field? A Time field is an element for displaying and selecting just the time (figure 1). This field type is currently not available as a standard Sitecore field. The two standard date/time elements in Sitecore which do exist are the Date field and the DateTime fields (figure 2). There are several occasions where a specific Time field could come in handy. For instance, the field can be used in templates for one day events or workshops when start and end times are required but not two different dates. The solution described in this post enables users to specify only what is necessary. Create a new C# class file (e.g. TimeField.cs) in your Sitecore project. Copy the following code in it (update the namespace appropriately). Save the file and compile the project. Now proceed with the ‘Sitecore Implementation’ section. Make sure the project containing the TimeField type is compiled and available in the \bin folder of your Sitecore solution. Then follow these steps within Sitecore. Open Sitecore in Desktop mode. Navigate to Sitecore/System/Field Types/Simple Types. In this folder all the simple types for the Sitecore templates are listed. Duplicate the Date item and rename it to Time (figure 3). Optional: Change the icon for the item to something more specific for time (e.g. People/32×32/clock.png). Enter the name of the dll that contains the TimeField type (without the .dll extension) in the Assembly field (example: NCIM.SitecoreTeam.Demos, figure 4). Enter the the namespace + name of the TimeField class in the Class field (example: NCIM.SitecoreTeam.Demos.CustomTypes.TimeField). Expand the Time item and open the Menu folder. Select the Today item and rename it to Now. Open the Now item and change the value of the Display name field to Now. Delete the WebEdit Buttons folder underneath the Menu folder. This enables the display of a calendar control in Preview/Edit mode and is useless for the Time field. The Time type should now be available as a simple type in Sitecore templates as shown in figure 5. An example of an event item with Start and End time fields is shown in figure 6. Figure 6: Sample event showing Start and End times. Create a new C# class file (e.g. Time.cs) in your Sitecore project. Basically this post is a recap of the “Sitecore and Continuous Integration” webinar, perhaps with some extra details about some subjects. The goal of continuous integration is to push every little piece of new software to next environments, the last step being production. Along this way, you want your software to be merged, compiled and tested. This way of developing has been around for a while with standard ASP .NET software. The problem with Sitecore is that it also heavily relies on the database to function. Source control of the database is possible, but can be a deviant complex task. Some guys at Hedgehog developed TDS, a licensed solution for all your Sitecore collaboration problems. This isn’t an option for everyone however, and you maybe want a more simple cost-free solution. Typical Sitecore development environment with multiple developer machines, development and version control servers and the published site. Make sure you install Sitecore Rocks before you continue. Watch Pieter Brinkmans webinar if you never heard of Sitecore Rocks before. Every developer has his own “dirty dev” web, master and core database, best not to use a shared database for development, as you will get in each others way. Create a different folder for your Sitecore libraries and let VS copy them to the bin folder on each build. In your web.config file, set a relative reference to App_Data in your datafolder variable. Make separate config files for each environment you are going to use. Also make separate ConnectionString.config files, unless you use the same settings on each environment. (Optional) You may want to consider removing the Sitecore shell from the project, depending on how badly you want use it in your development environment. Also, source control systems aren’t comfortable with large volumes of files. If you do decide to remove it, make shure you leave the Sitecore Rocks webservice intact. First, make sure you have a folder called “serialization” in your App_Data folder. This is the folder where our Sitecore items are put into text files. Use Sitecore Rocks to serialize the items you want to share. To do this, right-click the node of the tree and go to Tools/Serialization/Serialize Tree. Do not put the entire Sitecore tree in there, just the necessary like templates, content and media. Now that you have the files on disk, you can commit them to the rest of the team. Synchronize your serialization folder and perhaps the rest of the project. Now just click one of the Update options in the serialization menu and voila, your items are updated! Out of the box building and testing if you use Team Foundation Server. There is also this interesting article about Sitecore Unit testing without an HTTP Context. I personally use Microsoft Web Deploy to do this. 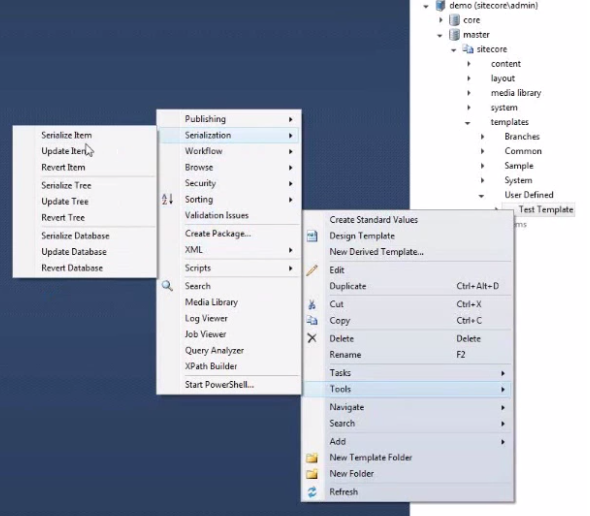 You can deploy directly from Visual Studio as well as a build server. I used this article to set everything up. Setting up continuous integration for Sitecore can take some time to perfect, but you will find it very productive once all the little daily frustrations are gone, making time to concentrate on building better websites. There’s an issue with our website since one of our content authors made some changes to the Sitecore content tree. Some items are not showing up on the site. Could you have a look what could be wrong? The first thing that comes to mind is that the developers could use item GUIDs in their code instead of (or better: in combination with) item paths or names when retrieving items from the database. The reason is that the item GUID remains the same even when the item is renamed or moved. This would prevent mapping mismatches in such cases. Warning: Do not use GUIDs to retrieve content items which are supposed to be dynamic or volatile. Access those items via their static parent item. For a truly dynamic & flexible approach a Setting item could be used which contains GUIDs and paths to the dynamic content items (this last approach is not covered in this post). Consider the following example of an online bookstore where individual books are stored as content items as children of the Books folder. The book items are based on the Book template (Figure 1). The individual books are considered dynamic content while the Books folder is considered to be static and therefore suitable to be accessed by the GUID. The next three code samples each show a GetBooks method which returns the exact same items: a list of books (from the Books folder) that match the Book template. Pro: If items are deleted and replaced by new items with the same name and location the solution will still work. Con: If items are moved or renamed the solution will break. Pro: If items are renamed or moved the solution will still work. Con: If items are deleted and replaced by new items with the same name the solution will break. // First try to get item via ID. // If no item is found try to use the item path. Pro: Works in both situations where items are renamed/moved or deleted and replaced with other items having equal names. Con: Matching templates by name (as a fallback) might not always be a good choice. You really need to make sure the solution uses uniquely named templates. The easiest way to copy an item GUID is to use Sitecore Rocks, double-click the item to open it and then click the small clipboard icon next to the Item ID (Figure 2). Although the usage of GUIDs in addition to paths and names result in more reliable solutions (which perform better than only relying on paths) the GUIDs are not very developer friendly with respect to readability and ease of use. The following code samples show how item mapping can be further abstracted by placing the identifiers (GUIDs, paths, names) in a static class. The structure of this static class can be modeled to mimic the content tree in Sitecore. This allows a more fluent use of identifiers for the developer and by keeping all the GUIDs, paths and names in one place it also improves the maintainability of the code. /// in order to provide fluent access to content item and template identifiers. You don’t need to create static model classes for standard Sitecore templates and items since they already exist! Have a look at the Sitecore.TemplateIDs and Sitecore.ItemIDs classes in the Sitecore.Kernel.dll. Here’s an example how to retrieve the content root item using the Sitecore.ItemIDs class. As you can see in the last GetBooks method which uses the model, using static nested classes result in quite some code bloat when calling the GetContentItem and IsTemplateMatch helper methods since the full nested hierarchy of the model needs to be specified as parameters. An alternative would be to use instance classes to define content and template items and implement interfaces for them. The helper methods could then accept these interfaces which further decouples the code and improves testability as well. The following code sample shows one possibility how instance classes and interfaces could be used to create a model. If you know any other code or item generation products or want to include other aspects, leave a comment here on the blog or send me an email! Our colleague Lucas Bol gave the first Dutch Sitecore guest webinar last week. The subject was continuous integration with Sitecore using open source products as an alternative to commercial products such as TDS by Hedgehog Development. The solution that is presented enables developers to work purely from Visual Studio and Sitecore Rocks without the need to create and deploy Sitecore packages. Lucas will soon post additional details here to further explain this solution. Welcome to the NCIM Sitecore Team blog! Hi! I’m Marc Duiker and I work as a .Net & Sitecore developer at NCIM. My first contact with Sitecore was at WoningNet, a Dutch company that provides products and services for housing corporations. It was love at first site 😉 when I started to use Sitecore. I was really impressed how easy it is to work with and how customisable the platform is. Since then I followed the Sitecore .Net Developer and the Advanced Developer trainings and currently I’m working on a Sitecore project for the Belgian railway company in Brussels. Hi! I’m Chantal Weijers. I’m an account manager at NCIM where I’m in charge of our partnership with Sitecore. Since my Advanced User training in London, I have assisted with the development of our website in Sitecore. During this process, I have come across several questions and problems where Marc helped me out. I think it would be useful for all of you, who don’t have a Sitecore developer sitting next to them, to understand how Sitecore works and how it can be used effectively. With this blog we try to bridge the gap between the developer and the marketer in order to take full advantage of the Sitecore experience. Together, and with the help of a few other colleagues, we will post both technical and marketing related articles on this blog, all concerning Sitecore of course. While we’re working on our first technical post, you can still sign up for the next Dutch Sitecore developer webinar (May 10) where Lucas Bol, one of our Sitecore developers, will explain how to set up a Sitecore development environment using open source tools. Who is the NCIM group? The NCIM Group specializes in seconding highly educated professionals to develop software in technical environments. Passion for technology – that is what every NCIM employee has. We work on technical and innovative assignments for renowned companies. From this background, NCIM and Sitecore established their partnership in 2011. The goal of this partnership is to provide the market with Sitecore knowledge to be able to enroll even more and better projects.